The group's winning performance on the Disney Animators Strike of 1941 came second to South Korea. 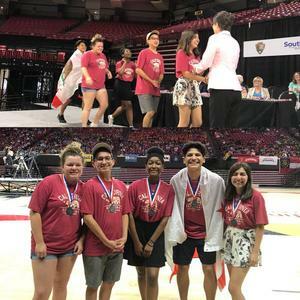 A team of students from Valley View High School earned a silver medal in the Senior Group Performance Category at the National History Day in College Park, Maryland on Thursday. The group performance by students Jade Moreno, Alondra Mendez-Acosta, Mark Valdez, Mitchell Calderilla, Ariana Bazile was titled A Conflict Concerning Unequal Rights Amongst Workers: The Disney Animators’ Strike. National History Day was established in 1974 and seeks to improve the teaching and learning of history. More than a half-million students across the country and internationally participate at the local level of National History Day with about 3,000 advancing to the national level. The Valley View group placed second to a team from South Korea. “The biggest components of our success, I feel, was our dedication to the project and our desire to win. It would’ve been so easy to just give up, because we were too stressed. However, we stuck through it and tried our very best,” said student Ariana Bazile, “I never could’ve imagined how successful we’d be. It feels like my group and I’s work has finally paid off." “This team of students spent countless hours researching and rehearsing their historical performance and we could not be more proud them,” said Board of Education President Susan Smith. The group was coached by Jeanine Schutze-Lopez. The District coordinators for National History Day are Autumn Earle-Rodriguez and Susan Young. Coach Corey Moore accompanied the team.